This document outlines two changes that may be required to use Java applications as a result of the Java 7 update 51 release. After updating to Java 7 update 51 or later, you may need to make a few changes to get it working with certain applications. The first of these changes is to set the security level to High. 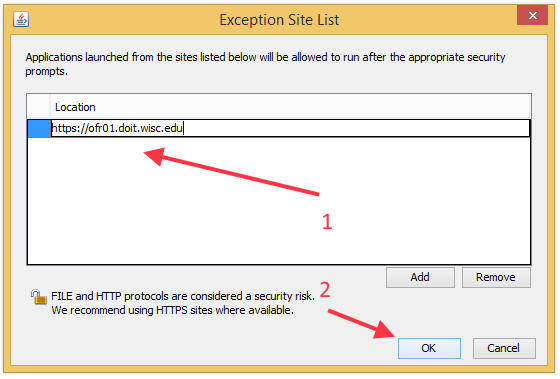 The second change is to add the application's URL to the exception list. Both of these changes can be done in the Java Control panel. This login error is displayed when the port number is included in the URL. It may be necessary to switch the 'view by:' mode from 'Category' to 'Large Icons'. The 'view by:' mode is usually in the top right corner. Double-click on the Java icon to get the Java control panel dialog box. Note: It may be necessary to switch the 'view by:' mode from 'Category' to 'Large Icons'. The 'view by:' mode is usually in the top right corner. Click on the Apple icon (upper left corner). Navigate to the Security Tab. If the 'Security Level' is set to 'Very High', reduce it to 'High'. Press the 'Edit Site List' button to get the dialog that will allow you to add the application's URL to the Exception Site List. Press 'Add' to type in the URL. On the highlighted line (see arrow # 1), type the application's URL (see Java - Compatible Versions for UW Services for a list of URLs). Click the OK button (see arrow # 2). 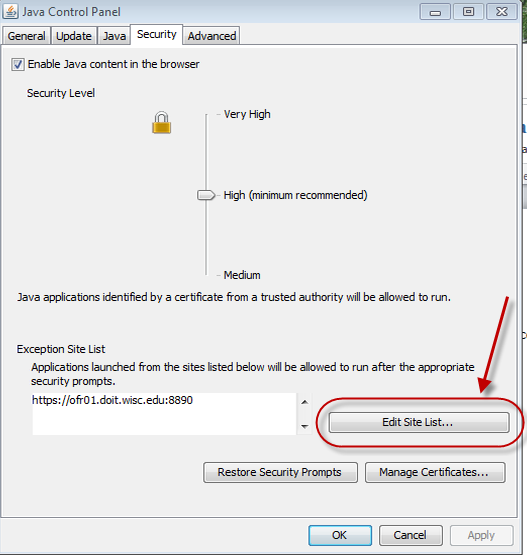 When done, the Java control Panel Security tab will look like the graphic in step 2 above if one does not enter any other Exception sites. After launching the application, the 'Do you trust' dialog boxes will still be displayed. To prevent this from happening each time, check the 'Always trust' boxes and click OK.